Very simple tool for users who need to interface with a device based on CAN (CAN/CANopen/J1939/NMEA2000/DeviceNet) such as motors, sensors and many other devices. 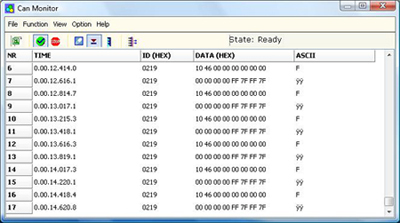 The Analyzer is composed by the software tool and by the Interface to the CAN. The device HD67316-U-D1 is an Analyzer with the interface port: USB. The device HD67316-E-A1 is an Analyzer with the interface port: Ethernet. The device HD67216 is an Analyzer with the interface port: RS232. The devices are supplied with free software CAN Analyzer for Windows, which can be used for all codes of CAN Analyzer ( ADFweb SOFTWARE SW67216 ). This tool allows the study and the configuration of CANopen systems using a user interface that allows easy access to the devices and their objects. Finds its increased use as an indispensable tool for the analysis of systems in the automotive industry and automation industry. 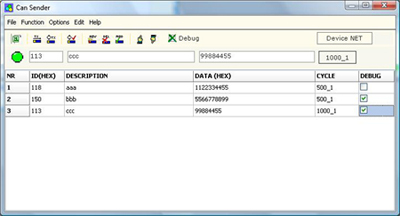 By the main window of CAN analyzer you can be approached to the varius functions. 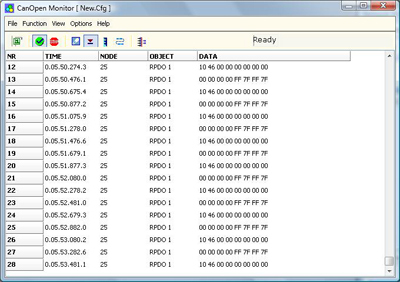 You can selected the type of CAN bus, standard or extended, and set the baud rate of the net. You can monitoread the net by CAN bus load, and have some LEDs for status indicates. 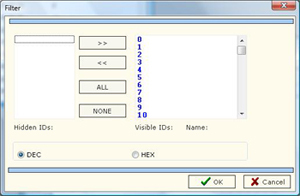 By this windows it is possible access to a varius forms, CANopen monitor, CAN monitor, Network manager and CANsender. Change the state of node ID (pre-operational, operational). This form is available in both types of CAN bus (standard and extended). It visualize all CAN bus frame that pass on the net. It visualize the: COB-ID and the data. This form is aviable only if the Type of CAN bus is standard. 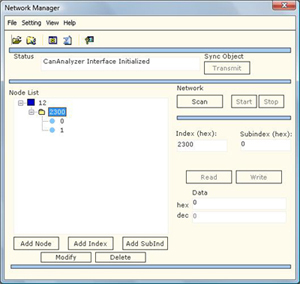 It visualize all CANopen frame that pass in the network. It visualize the: node, type (SDO or PDO), and the data. By this form it is possible filter the varius frame. 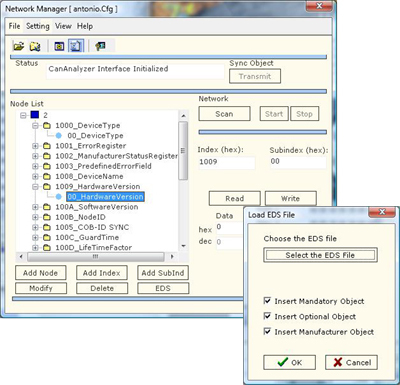 On the network manager window click on the button “EDS”, appears “ Load EDS file” window. From this window you CAN load an EDS file for CANopen.